Vladislav Svriduk ’19 drives into the paint against Tilden. Boys basketball had been down to the Madison Knights the whole game when, with 30 seconds left in the fourth quarter, shooting guard Thierry Blyden ’20 hit a three pointer to give the Hornets their first lead, 71-69. The crowd roared and jumped to their feet in celebration. But the mood quickly shifted as Madison tied the score 71-71 in the final ten seconds, sending the game into overtime. 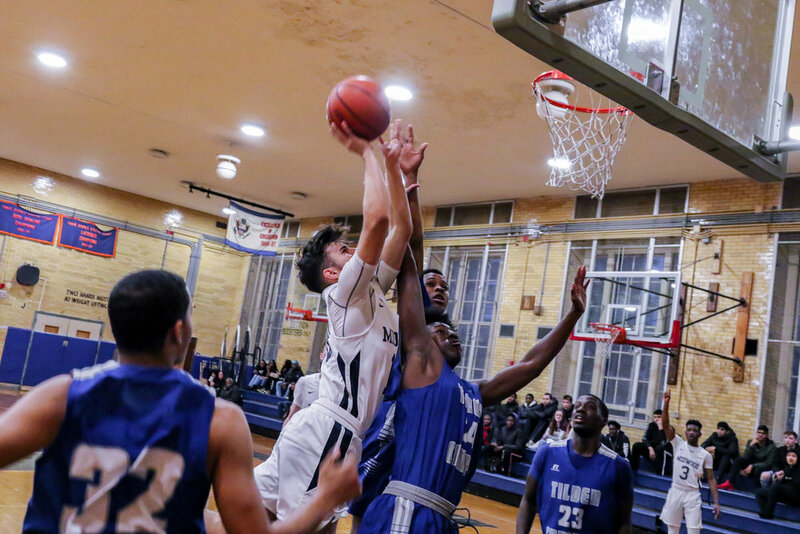 Midwood ended up losing a heartbreaker 73-72, and the boys basketball team has now fallen to a 3-5 record despite this hard-fought battle on their home court December 19. “We lost by a point to a team we shouldn’t have,” said Mr. Victor Gjecaj, the varsity basketball team coach. “That’s not something any of us expected,” said point guard Jonathan Dekhtyar ’20. Midwood stayed aggressive but couldn’t always convert at the free throw line, missing seven out of 25 free throw attempts. “One challenge we are facing has to be free-throw shooting,” said Captain Andy Dokovic ’19. Last year, the team finished 9-8. On the plus side, Midwood’s defense lead to more offensive opportunities through the fast break. In a fast break, the team moves the ball up court and as quickly as possible after a defensive rebound so that the opponent’s defense is outnumbered and doesn’t have time to set up. One offensive play Midwood runs against a man defense is called “motion.” It’s a continuous offense with V-cuts that allows everybody on the court to get involved and gives as many players as possible the opportunity to score. “This play could be really effective if we stay patient,” said Jean Baptiste. Making a push for playoffs this season is a common expectation shared by the teammates. With goals set high, the next step is to put them into action. “We plan on achieving these goals by working hard in practice and playing together,” said Jean Baptiste. The team practices six days a week, with conditioning in the weight room, and devotes at least two hours on the court to working out game plans and strategies. To get there will be challenging. Sometimes the Hornets’ biggest obstacles come from within. “When things aren’t going right, I get hard too hard on myself, “ said Jean Baptiste. “We’re our own worst enemy,” said Dokovic. But with ten games still left to be played before playoff brackets are released, it’s not too late to turn things around.